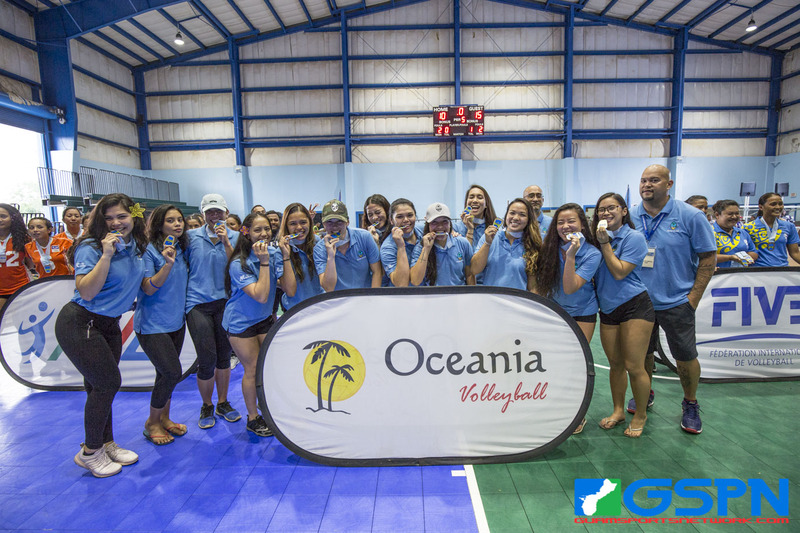 Colonia, Yap – Guam women’s volleyball is gold once again! After suffering tough losses to Palau and RMI in regular-play, Guam looked like a different, more ready team in the playoffs. Guam handled Palau in straight sets in the semifinals and got a near sweep of RMI in the gold medal game winning 25-23, 26-24, 20-25, 25-17 Friday afternoon. Guam’s Muneka Taisipic and Mary Gillan supplied the offense as Taisipic finished with 11 total kills to Gillan’s 10. Guam’s offense functioned as well against RMI as it did against Palau, which was a product of the chemistry the team had forged through the Micro Games so far. Even when facing the toughest losses, the girls never had their heads down for long. “We came into those first games thinking we had won already so those losses really humbled us. It gave us more wit coming into the playoffs. Our camaraderie and communication was there the whole time,” said Taisipic. “I had to remind the girls that even though we lose a point, we have a chance to get it right back. The games have been difficult, but these girls made it easy for me to trust them,” said the captain Gillan. RMI’s Sidra Triplett was still a force of nature as she registered 21 total kills in the loss. Guam’s defensive put out their best effort to defend against RMI’s most dangerous weapon, which included tightening the line-up, most especially in the gold medal game. “We executed the game plan. We gave everyone as much playing time as they deserved, but in the end, we finalized our starting six for the playoff run,” said head coach Mike Rabago. Endurance was a big part of Guam’s strong playoff run and they gave credit to the Claros brothers at Custom Fitness for their ability to survive all the five-set games. “It really came down to our conditioning and fitness levels, so a huge shoutout to the Claros brothers. Conditioning really saved us down the at end because it was like Christmas, RMI was gifting us the ball for us to hit back down on them,” added Rabago on outlasting RMI. Gillan grabbed Guam their first lead in the opening set with ace to go up 12-11. Taisipic started to get going with two kills to keep Guam ahead 15-13. Pedro started to heat up for RMI as she scored three straight points to tie the game at 16 before Joie Blas gave Guam back the 18-17. Triplett and Gillan traded blow for blow to get to 22 all, but errors and a kill from Taisipic gave Guam the early advantage 25-23. RMI struggled to find their footing in the 2nd set and Gillan took complete advantage. Gillan scored three of Guam’s first six points, but RMI’s defense managed to keep them close down 9-7. Kier would make her debut in the game, getting two aces to give Guam a 14-13 lead. Guam would take their biggest lead 21-16 after a kill from Lori Okada. RMI would go on a 5-0 run to tie the game at 21, and Triplett would give RMI a 24-23 lead off a cross-court kill. Errors would due RMI in as Guam played mistake free down the stretch for a 26-24 win. Triplett and Pedro would carry RMI in the 3rd as Guam dropped their only set of the playoffs 25-20. Triplett locked in seven kills in the winning set for RMI. Late in the 4th, Guam started to sense fatigue from RMI after a 16-all score. Kier would lead Guam from the service line in a 4-0 run to get up 20-16. RMI would score their final point on an error from Guam before Gillan stepped up to serve the final four points, which ended in a game winning tip from Okada to give Guam gold. The obvious difference between the 2014 Micro Games team and 2018 is the roster. But missing from the 2018 squad for Mary Gillan is her older sister and volleyball star Emma Gillan. The two were able to share a gold medal moment in 2014 with Emma as captain, but the younger Gillan in Mary was tasked to lead the team this time that still resulted in gold. Volleyball also runs deep for Taisipic, who is competing in her first games. The young star is the offspring of Shelly Taisipic, a former Guam volleyball star back in her heyday. Winning a gold medal in her first go-about was only the beginning for Muneka. “It hasn’t really kicked in yet,” said Taisipic directly after winning gold. “This is just the beginning for us and for me being able to continue my mom’s legacy. It gives me a greater sense of purpose to be able to bring home these medals,” said Taisipic.